I just picked up a copy of the Epic Warrior Muscle program that was created by BuiltFit.com’s Tom Calkins and wanted to do a review of the diet and workout program for anyone interested in purchasing it. 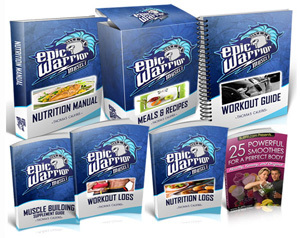 My initial thought was that after purchasing the Epic Warrior Muscle that it might be confusing to set up my membership so I could login and get access to all of the products, but it was actually simple taking only a minute to do which was great. I was instantly able to access to the product and get started. A+ in my review for the ease of access. The Epic Warrior Muscle ebook was pretty much what I had hoped it would be. You will get an in-depth look at exactly what you are going to have to change about your everyday routine in order to start gaining muscle. It goes through things like your mindset, what to eat, how to workout, and a bunch of other muscle building tips and info. The next thing I took a look at was the Epic Warrior Muscle Workout Guide. It is awesome how in depth Tom goes in this workout guide. He talks about the all important goal setting, exactly what type of training you will need to be doing in the gym, and even into little things that go a long way to building muscle including rest and sets/reps. He lays out the exact workouts you will need to do depending on how many days you can workout. Although supplements are not needed to gain weight from the Epic Warrior Muscle they definitely can help. They break down every supplement you have questions about – not only looking at categories of supplements, but going into depth with the specific popular supplements out there for building muscle. This report was one of my favorite parts of the EWC program. The 25 smoothie recipe book is pretty much exactly what you would think it to be. I had been blending up basically the two same protein shakes for the last I can’t even remember months until I came across this guide which gave me some other tasty ideas. I now have 5 protein shakes I switch between depending on what I am feeling. All of the shakes are great for people looking to gain muscle which was cool. My review of the 7 day meal plan – damn they got it spot on here. Many workout programs only give you samples of what to eat, but Tom lays it all out for you. This includes 7 full 7 day meal plans depending on how many calories you need to intake daily. You will be able to choose which 7 day meal plan is right for you and then open up that ebook and find a full weeks worth of food to eat! I struggle finding a variety in my food so this helped me a ton. Another favorite section of the Epic Warrior Muscle program and in my review I give them 5 stars here. The above protions of the Epic Warrior Muscle may take you a while to get through reading wise, but it is all worth it and will help you meet your goals of gaining muscle (and quick). On top of that stuff the exercise guide, 12 week printable workout logs and the nutrition and workout tracking files were all very useful. I highly recommend the Epic Warrior Muscle, and the great thing is you can get it for a small fraction of the price of just a few personal training sessions. Click here to get a discounted price of the Epic Warrior Muscle! Thanks for the great review. Do you believe that the workout program can be adapted for home exercise with an adjustable dumbell set (Powerblocks) ? I gave up my gym membership a long time ago in favor of home exercise and have thankfully been way more productive that way. I am always a fanatic about expanding my home fitness library….. unfortunately this isn’t a follow along DVD workout which is what has been working well for me….. still, I’m intrigued! Hey Brandon, sorry I didn’t see this comment until now. I would suggest this program for people with gym memberships only because of the exercises included. There would be ways to get around the exercises without gym equipment, but wouldn’t be as effective.